Yesterday was an interesting morning here at the Rocky Mountain Lodge. The power went out just as we were to start cooking breakfast for our guests, and was out for almost 2 hours. Fortunately we had made coffee earlier so everyone had coffee. Our only saving grace was that we have a gas stove and were able to use a lighter to light the burners. With a last minute change of menu we were still able to pull off our signature 3-course breakfast and cook without electricity. 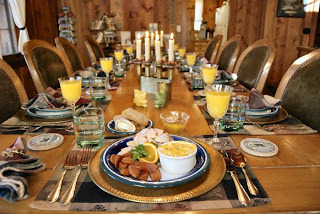 Check out our Bed and Breakfast rooms at our website’s Bed and Breakfast page, or see pictures of some of our breakfast on our Breakfast page. This entry was posted in Uncategorized and tagged Breakfast Recipes, Cooking Tips, Miscellaneous by Debbie Reynolds. Bookmark the permalink.